Have you ever wondered what it would be like to no longer stock hundreds of cones of thread and to have an unlimited gamut of colours available to you instantly? Well wonder no more for instant thread colouring machine Coloreel is about to hit the UK embroidery market and it is as incredible as it sounds. P&P editor Melanie Attlesey reports. I was kindly invited to the home of Coloreel in Jönköping in Sweden to see the instant thread colouring unit firsthand by its inventor Joakim Staberg. Upon my arrival I was greeted by Joakim, as well as CEO of Coloreel Mattias Nordin and vice president of sales and marketing Magnus Hellstrom, who were eager to tell me all about this incredible invention. I must admit I was a little apprehensive as to what to expect from the Coloreel, for many inventors claim that their product will truly revolutionise the world, but the reality often differs. However in this instance I believe they may have hit the nail right on the head. With a background in helping large corporations bring innovations to market with his company Inventech, Joakim first encountered the textile industry around 15 years ago and what he learnt about the embroidery industry shocked him beyond belief. “If you look at the logos of companies or clubs or anybody else that uses embroidery, the real colours they want barely ever match. How can you have all of these reels of thread in stock and still not have the right colours for your customers? And on top of that the tiresome setup-times changing all the thread reels. I couldn’t believe that the industry could work like this. It felt almost like medieval times. It’s a problem that we have loved to solve over the years,” he says. In 2009 Joakim decided that Inventech should focus solely on bringing to market a machine that instantly coloured thread so embroiderers no longer had to worry about stocking large volumes of thread or not having the right colour in stock. And nearly 10 years later Coloreel is about to disrupt the embroidery market. “I was looking for a solution for the industry’s problem and that’s when I got the idea. What if you just used white thread and dyed it instantly? And preferably put it straight into a textile production process, like embroidery or sewing, without the need of any post-processing? At an early stage I read that the dyeing process for the thread manufacturers was between five to eight hours, but this didn’t scare me. It just made it a greater challenge to solve,” says Joakim. But after years of tweaking and refining, Joakim and his team have invented the seemingly impossible. A single piece of white thread enters the Coloreel, where it is dyed and dried before passing out through the other side and into the embroidery head. Any old white thread will not do and instead the unique Coloreel thread should be used as this thread has been specifically manufactured to ensure that it can be dyed in the unit. Many years were spent developing the thread so that the ink fixation could reach deep down into its fibres, so it can conform to ISO standards such as wash fastness, bleaching and sunshine. Coloreel has partnered with the global printing technology company Ricoh. Ricoh has helped to develop and build one of the major sub-systems in the Coloreel unit based on its inkjet printing technology and Coloreel’s technology for colourisation. While the ink used has been developed in co-operation with a leading global ink supplier. The unit has been designed to be as unobtrusive as possible and can be used with any make or model of embroidery machine. 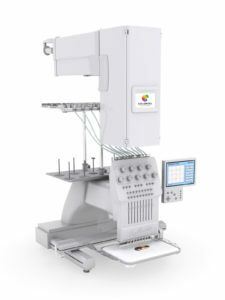 Coloreel has no mechanical or electronic connection to the embroidery machine, which makes it entirely independent and able to be placed above any machine. Maintenance of the unit is also minimal, which is good news for those who may be wary of using a print mechanism on a daily basis. Users digitise an embroidery in their favourite digitising software. Then they switch to Coloreel’s special embroidery colourisation software, to add any number of perfectly matching solid colours, soft transitions between colours and other stunning effects that has been completely impossible to do, until now. Then the user inputs the usual stitch data into the embroidery machine e.g. by a LAN connection or via USB stick. The same stitch data and the colour data is then input into the Coloreel unit which works out what lengths of the thread needs to be dyed per colour or effect, taking into account the thickness of the fabric that is being stitched and more. And it does all of this in a matter of seconds and that’s what makes the unit remarkable. 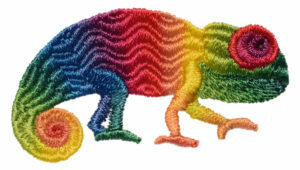 The speed of the embroidery production will be higher the more trims the digitiser can remove from an embroidery design. The embroidery quality will also be higher since there will be less need of lock stitches and trims with threads hanging out from the backside of the embroidery. “The whole strategy and business idea of Coloreel is based upon one thread, unlimited colours,” explains Mattias. And I believe this statement to be entirely accurate. Upon witnessing the Coloreel embroider the name of the magazine in a variety of colours, using a single piece of thread, in a matter of minutes, I can honestly say I was blown away. You can view the video below. The Coloreel certainly lives up to and exceeds expectations. It will ultimately change the way many embroiderers think about embroidery. Magnus joined the company in September 2017 and his role was to work on the commercialisation of the product and to seek out distributors across Europe. It was Tony Dorsey’s (managing director of AJS Embroidery Services) persistence and enthusiasm for the product that made him stand out from the crowd and meant he was selected to be the UK distributor for the Coloreel. Tony says: “Just before I started working in the embroidery industry back in 1988, a trimming mechanism had recently been brought out to speed the process up. Since then apart from becoming a little bit faster and a bit of sequins here and there, nothing spectacular has been developed in the embroidery world in the last 30 years. 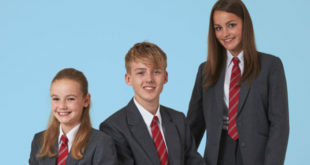 As well as solving the issue of colour matching and more for embroiderers, the team sees many more uses for the Coloreel technology in the wider textile industry. The main one is the possibility of sampling for thread manufacturers. Currently when a thread manufacturer wants to create a new colour thread for a company or a designer they have to create a test batch in huge chambers at reduced volumes which is expensive and also brings with it a whole host of environmental issues. But if the thread manufacturers could use a machine like Coloreel to sample colours directly, before producing the final run, it would save time, money and the environment. The official launch and live demonstrations of the Coloreel unit will take place at Avantex in Paris, from September 17 to 20. Soon after this, a few Coloreel units will also be available for demonstrations at AJS’ premises in Nottingham. Production of the Coloreel units is due to begin in the autumn in Sweden, with the product becoming commercially available in November, but AJS has already started taking pre-orders for the Coloreel units as the interest is that high. AJS will also show and demonstrate the Coloreel units at Printwear & Promotion LIVE! from January 20 to 22. Always have the right colour thread when you need it. Unlimited solid colours, amazing gradients and other effects. Possibility to quickly change colours in a design. No set-up time with changes of thread reels between orders. Less down time and stops in the machinery. The thread will work on any material that today’s embroidery threads work on. The only real disadvantage that I can see is the initial investment cost. 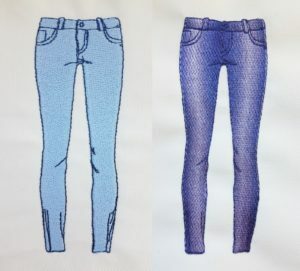 The high cost of the machine may initially put it out of reach of smaller embroidery companies until the price comes down. However, if you look at the total business case taking all of the advantages into account you will ultimately save money year on year by using Coloreel, due to increased productivity.